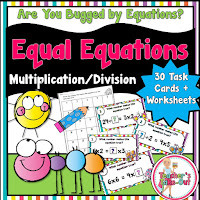 Multiplication and Division Resources to use in 3rd-5th grade classrooms. 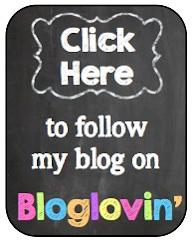 Scroll down and click on each multiplication and division resource to read more about it. 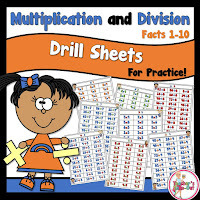 Multiplication and Division Fact Drills will get your students to stay sharp on their facts. 64 half sheets are included. Instead of writing the facts down on paper, try these drills instead. Students use the sheet to just recite and learn their math facts. 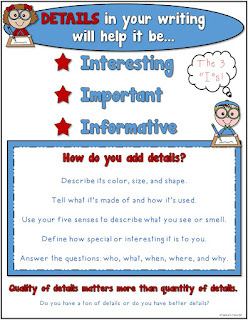 These are great for small group or tutoring. 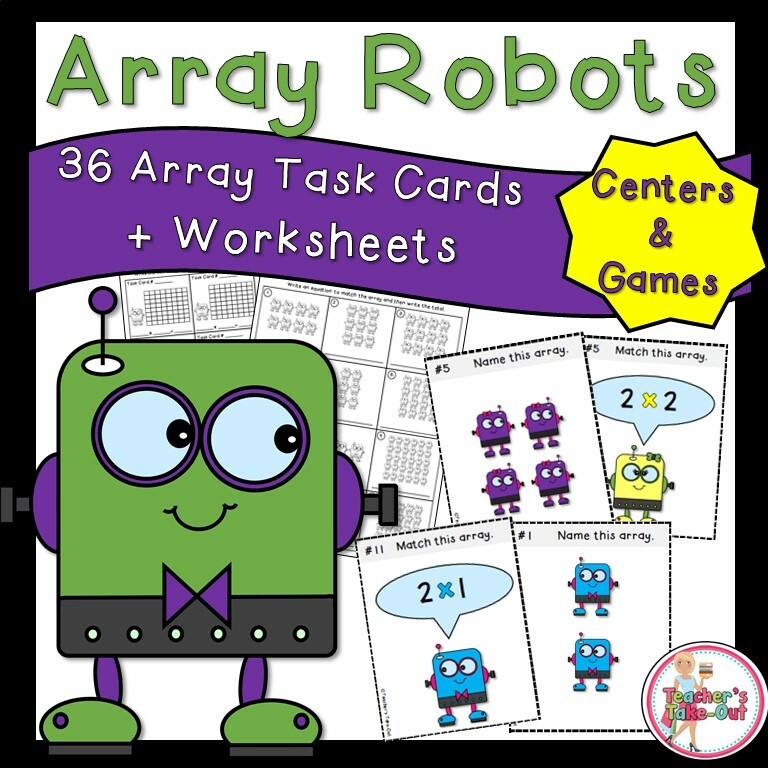 Array Robots are all about ARRAYS! 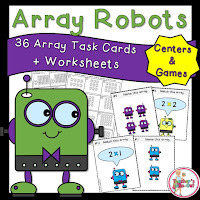 This fun robot theme has students counting and match arrays with their number sentence. 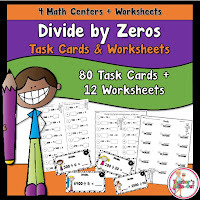 This pack includes task cards and worksheets to use during your lesson or at a math center. Click the picture to read more about it and check out the preview to see more. 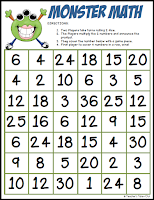 Need some Multiplication or Division Games? These packs are loaded with some fun and engaging game boards. These are perfect for practicing multiplication and division facts. Have you seen these Multiplication and Division games? They are all about a monster theme for factors 1-10! Each game board works on one factor at a time. Also included is a missing number game. These game boards will meet the needs of all the learners in your classroom as they learn and practice their multiplication and division facts. These are no Prep Games Boards. Just Print and Play! Try a Free Division Game Board today! Free Division by 3s. Need more Monster math games? This unit is wildly fun and engaging. There are a total of 13 games included. All you need are 2 dice, tokens, and players. Each board game also comes in a black and white version. Players will be learning and practicing the factors of 1-6. Fact Family Centers for Multiplication and Division includes some fun interactive fact family boards to keep your student engaged. This pack includes two centers. The first center includes 20 Fact Family houses. Each house has the three numbers that can make up a fact family. Students place the cut-out numbers on the fact family houses and record their answers on a recording sheet. The second center has 24 task cards that students write the 4 fact family equations. Try this fall theme Fact Family Task Cards. This pack comes with three math centers. This pack will give your students a true understanding of fact families. Are you bugged by equations? This fun and zany bug theme uses multiplication and division equations. Students find the missing number that makes the equation true. 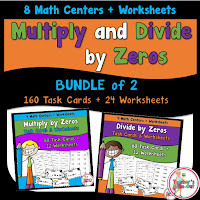 This pack is great to help students practice multiplication and division facts. Mean, Median, Mode, and Range includes 30 task cards. Use the task cards at a math center. You can also use these task cards as data cards and make a bar or picture graphs. Have you tried Number Ladders? These are great for number sense. Students multiply and divide as they move up the ladder. They must be at a certain number when they reach the top of the ladder. 20 Number Ladders are included. Another 10 Ladders are included for a challenge. Students see the numbers go up the ladder and they have to decide if the numbers are multiplying or dividing as they move up the ladder. All ladders come in a black and white version too! Number Ladders come in 5 versions. Try the addition, subtraction, multiplication, and division too. Addition and Subtraction are available too. Try Here for more information. 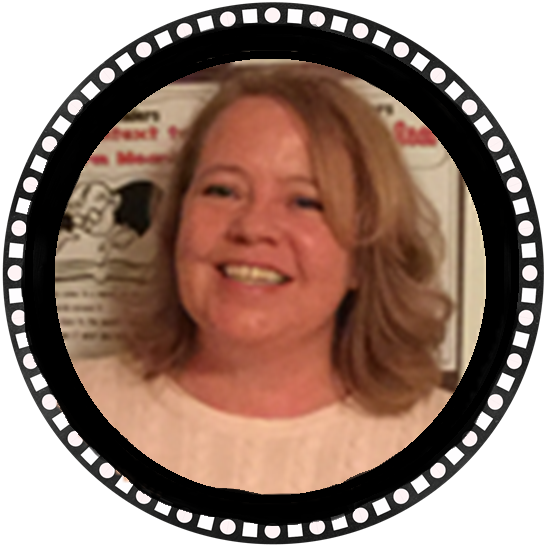 Are you working on multiplication? This Pack has students skip counting to learn their multiplication facts. Included in this pack are Posters for facts 2-10 and a skip counting booklet to learn counting patterns. Hang the posters on your math wall to help students learn their multiplication. 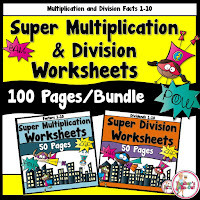 Super Multiplication and Division Worksheets are loaded with facts 1-10. 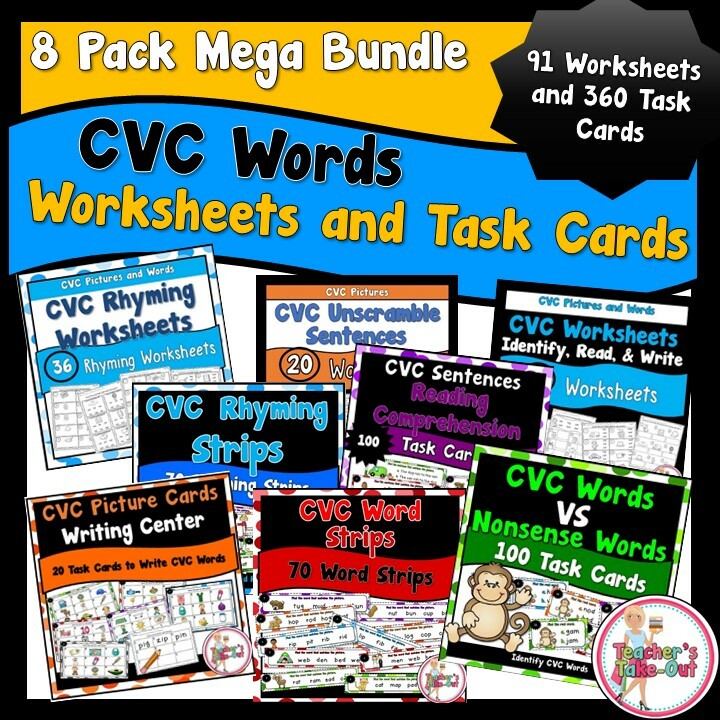 Each pack includes 50 worksheets. 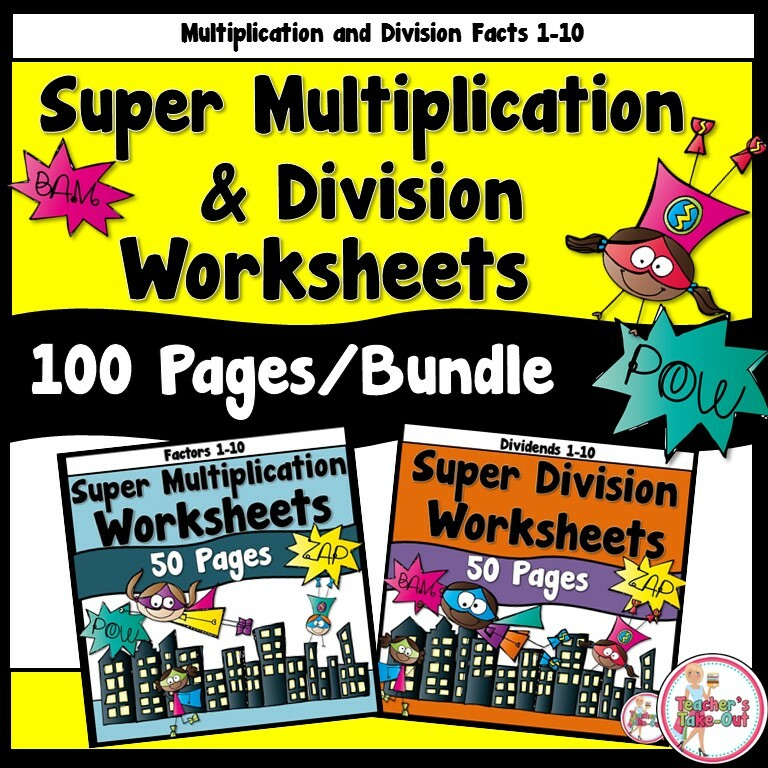 These packs will surely have your students working on multiplication and division facts all year long. 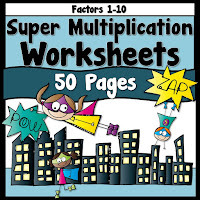 The pages have a super hero theme with some fun puzzles and engaging worksheets to make learning fun! 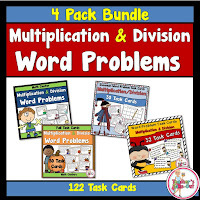 This pack includes 30 multiplication and division word problems. These are fun and engaging cards that will have your students wanting to do more. Place at a math center or play a fun game of Scoot. Use the recording sheet to record answers. 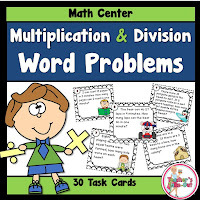 Here is a bundled of all the multiplication and division word problem task cards. 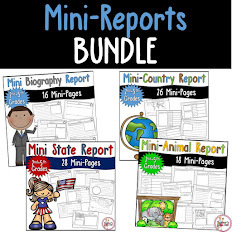 This pack will keep your students multiplying and dividing all year long! Multiply by Zeros will help get your students to think in mental math. These will also help them get ready to divide long numbers and think about estimation. 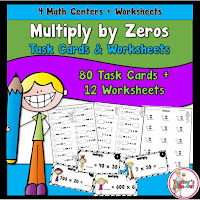 This pack has 4 math centers with multiplying by different amount of zeros. This pack has task cards and worksheets. This also comes with divide by zeros and both of them bundled together. 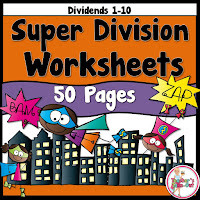 Every classroom needs the Division Vocabulary Poster. This helps keep everyone of their division vocabulary. Click the picture for your free download. Do you have students say they don't know how to figure out a multiplication fact? Not anymore! Show them this poster for a way to figure out their multiplication problems. There are plenty of ways to try and figure it out. Click the picture for your FREE download. 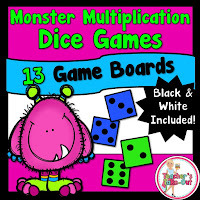 Monster Math is a fun multiplication game using 2 dice and the factors of 1-6. Just print and play. Students will have fun learning their facts! 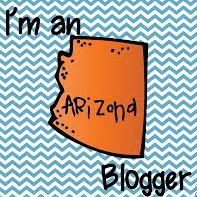 I also offer a discount on products found on this blog.